Murals @ Gopeng, Malaysia - Always Travelicious ! The mural craze is burning from Penang, to Ipoh and even to to sleepy town Gopeng. Gopeng town is small so you can easily find the 5 murals after driving around a few minutes near the roads on Jalan Tasik and Jalan Pasir. Or just ask the locals and they will be happy to point out to you. The murals are becoming more and more creative and you can easily merge into the murals as a 3D prop by sitting on the chair, and share a noodle eating moment with the two kids. And where did the two kids get their noodles from ? From the hawker store (mural) selling noodles and “yong tau foo” right next to them of course! The murals in general tell a way of life in Malaysia. Enjoying a meal at a hawker place, Orang Asli chilling in his kampung house (with kampung chickens running around!) and the festive celebration of Chinese New Year. The Chinese New Year mural depicting lion dance is really interactive too where you can play with the drum! 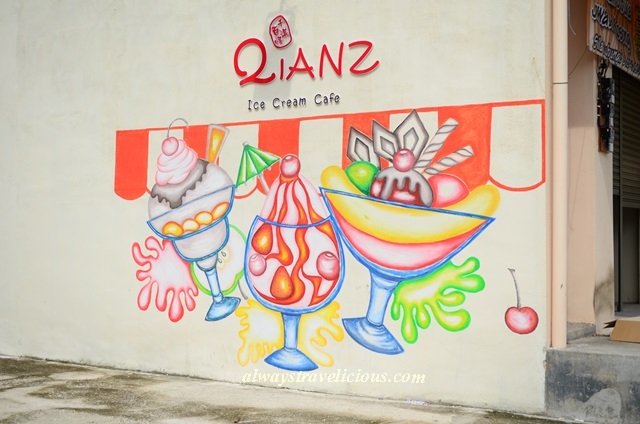 The last mural is more of an advertisement mural for the upcoming “Qianz Ice Cream Cafe”. Their Chinese name is “qian qi bai guai” (千奇百怪), literally meaning thousands and hundreds of weird things. So let’s see how weird their ice cream flavor can get when they launch!